Bull is a black lab/mix. His hair seems to fade from black to dark brown. At 2 years old, he is full of life and ready to play. The shelter is pretty sure he considers himself a lap dog if one could be provided big enough for him to use. Say hello to Sky. He is a lab/aussie mix with a beautiful blue eye. The shelter gets tickled at his Elvis lip when he looks at you. He’s short but beautiful. At 1½ years old, he is ready to settle down with his forever family. 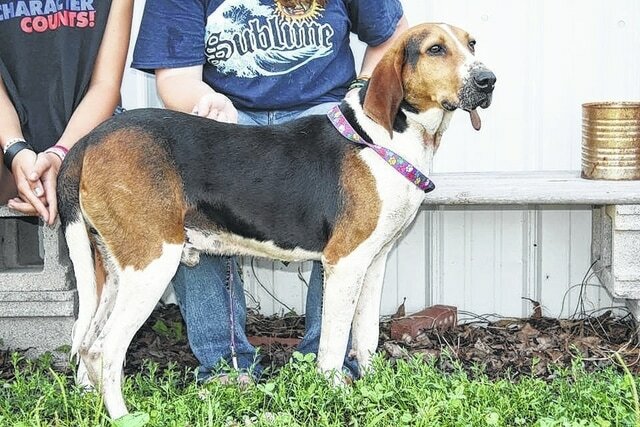 Tigger is a Treeing Walker Coonhound. He just loves the girls and is quite the charmer. He is 1½-year-old gentle, big baby. MEIGS COUNTY —The Meigs County Dog Shelter is located at 41790 Fairgrounds Lane in Pomeroy. Donations of food, gas cards and monetary contributions are always needed and welcomed. Volunteers are also appreciated. For information contact the shelter at 740-992-3779.